Apply Reflect Debuff to self, allies at target, directly adjacent. + +8~16 CP to self, allies at target, directly adjacent. My lord, please, call me something like.... 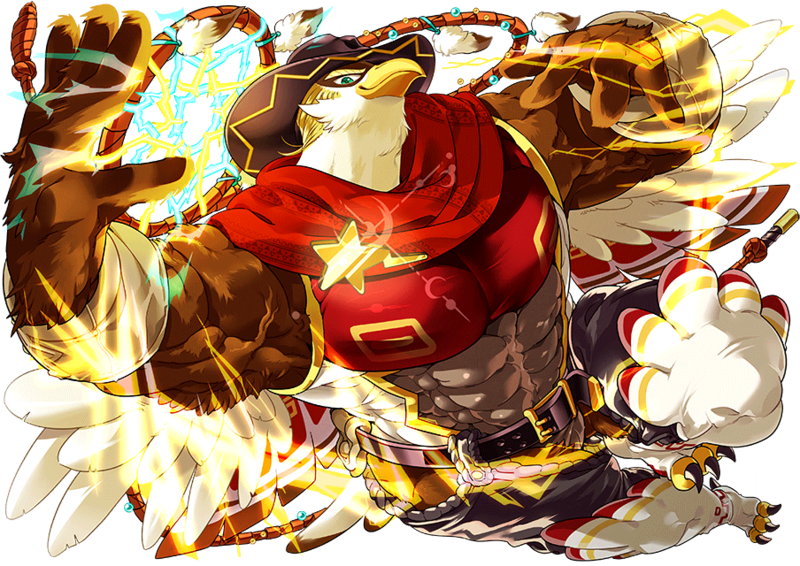 Hero of the Downtrodden, Thunderbird! Understand, baby? Dry those tears, baby! That's right, your hero has arrived! This is your punishment baby! I made a pledge to the lightning... No tear shall be shed again! Furious Windstorm, Ihanbla Gmunka! Sad, sorrowful children...! Don't ever forget! There are wings protecting you from the sky! Farewell!! 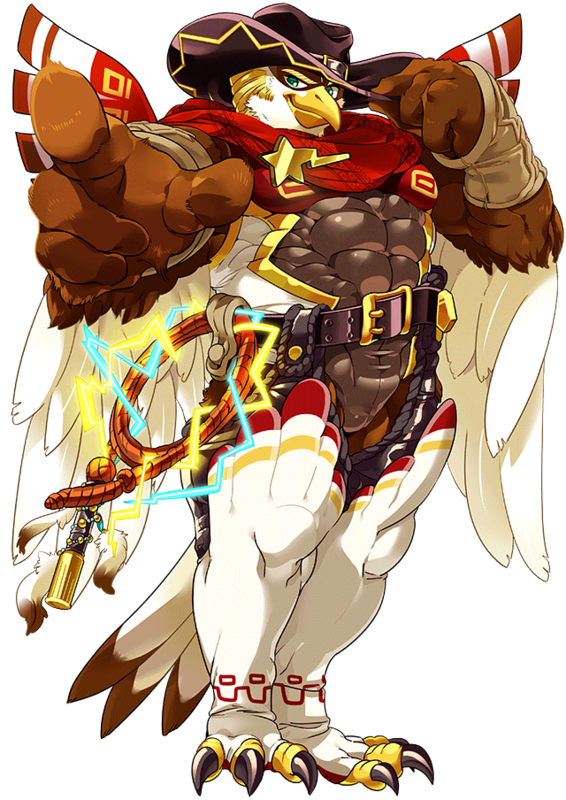 An Avis Therian from the world of the Great Spirit, his public identity is that of a bartender in Shinjuku, but he doubles as a superhero, protecting Tokyo with the help of his trusty Whip. He's also a dandy with a flair for grandiose terms and melodramatic overreactions. The guild to which he belongs is one that represents the underdogs, the hated, and the forgotten. In his home world, he watched from above as the majority razed the minority to the ground, time and again. Thunderbird gets along well with other adults who boast discerning tastes, though he has a habit of chasing after whales whenever he sees them. A birdman Transient originating from the other world Great Spirit. In public he is a bartender for a certain store in Shinjuku. In private, he's a whip wielding hero protecting the peace of Tokyo. He's a dandy prone to speaking like he's in a play and a smug overreactor. He belongs to a certain guild, always standing with the neglected, forgettable minorities facing the majority. One time in his home world, he watched from the sky as many forces were destroyed by a smaller force. He gets on well in speaking with adults who can taste differences in flavors. He has a habit of chasing after whales when spotting them. His Whip is a Sacred Artifact that reveals its true power when both ends connect into a ring. The weave of lightning created within the ring catches bad dreams and leaves peace in its wake. Thunderbird lives as a hero in remembrance of one who once lived and died by his side. To be a wild Joker who can smile for the suffering minority, and who cries in the face of the majority's triumph, such is the way of the lightning spirit that lives in his heart. He continues upholding the path of the Joker as a hero here in Tokyo, having chased that life from his own world without ever reaching the Great Mystery. Thunderbird avoids sacrificial dogs. as they bring back painful memories for him. The leather whip Sacred Artifact he holds shows its true power when its ends are put together to form a ring. The lightning net produced within the ring captures only sad dreams, leaving the target in a state of tranquility. The reason he lives as a hero now is due to how a "certain someone" he knew lived before, and how he can't forget their leaving of him. He is a thunder spirit he continues to hold that in his heart, becoming a hero who smiles for the sake of the little guys and a clown who dries the tears of the many. His wish to connect with the "Great Mystery" went ungranted, so he suceeded the life of the buffoon driven away from his home world and continues fighting as a hero in this Tokyo. When he sees dogs ceremonially sacrificed, he recalls sad memories and as such bad at dealing with them. For some reason, his voice and hi style reminds me to Vashyron from Resonance of Fate. Whale is gambling slang, similar to high roller, it refers to people who spend large amounts of money in a casino. It refers to Gandharva. I wonder what the whale comment refers to though. "dogs ceremonially sacrificed" so he mean inugami. That why he hate Kenta. In the Japanese version, Manjoume begins calling himself "Manjoume-san da", which can be translated as "It's the Manjoume", or "That's Manjoume-san (Sir Manjoume) to you" which is a play on his insistence at being addressed formally. The North school students mistake this for "Majoume sanda" or "Manjoume Thunder", as the Japanese "sanda" has a very similiar pronunciation to the English word "thunder". The nickname ends up sticking, and is implemented into a chant. In the English version, Chazz sometimes refers to himself as "The Princeton" and later "The Chazz", while the chant is changed to "Chazz it up", a play on the term "jazz it up" and he also begins using "you go bye-bye" as way of indicating his victory, much like Jaden uses "that's game!"